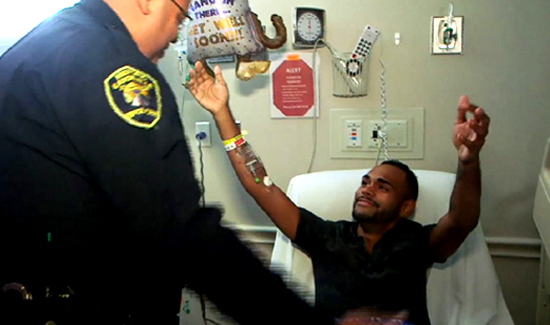 Orlando shooting victim Angel Colon was reunited in a local hospital today with the police officer who saved his life. Angel Colon, who was shot three times and critically injured at the Pulse nightclub early Sunday, was able to survive after Eatonville Police Officer Omar Delgado pulled him out of the club, according to hospital officials. Video shows Delgado visiting Colon today at the Orlando Regional Medical Center. Colon and Delgado, who were seeing each other for the first time since the shooting, smiled at each other as soon as Delgado walked into the hospital room. The two embraced for several moments while Delgado told him repeatedly that he was “so glad” he was alive. Colon’s family cried and hugged each other in the background while Colon and Delgado interacted. “I’m getting there, little by little,” Colon said, before showing Delgado exactly where he was injured. Colon’s room was filled with balloons and flowers.